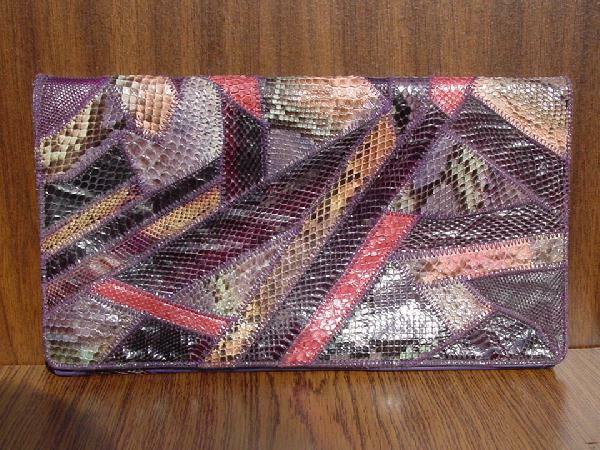 This vintage multicolored snakeskin and lizard purse has a multicolored metal 37" chain which can be tucked in so you can carry it as a clutch. It has snakeskin and lizard in seafoam green, warm salmon, peachy-pink, taupe-gray, maize, brown, magenta, light caramel, lavender, bone, and black. 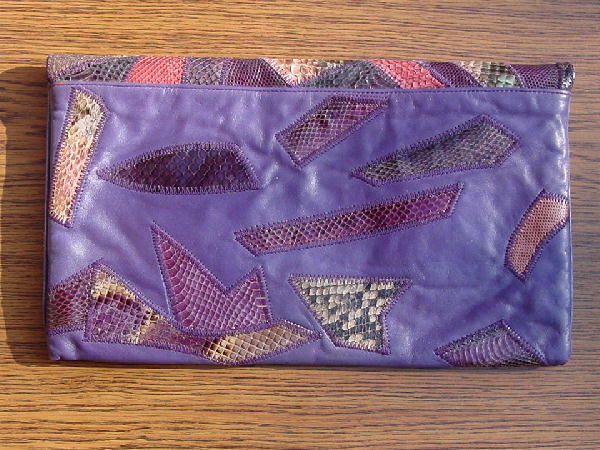 The rest of the exterior of the purse is in purple leather. It has a snap closure and a black interior with an open pocket. There is some discoloration (rust color) at the 4 bottom corners where the purple dye came off. It's definitely eyecatching - even when you flip the front flap up you see the same design as the back has. It looks great with so many colors. It was used in a photo shoot with a purple Thierry Mugler raincoat, black Donna Karan pants, and Christian Dior snakeskin cowboy boots.